Manthorpe Smart Verge Dry Verge is a fast-fit Dry Verge System that provides an extremely cost-effective alternative to mortar that avoids all of the long-term maintenance problems, and the costs, that are often associated with traditional mortar bedding. The individual verge units cap the end of each course of tiles to provide an unobtrusive, weatherproof cover whilst preserving the ‘stepped’ appearance of the roof tiles. 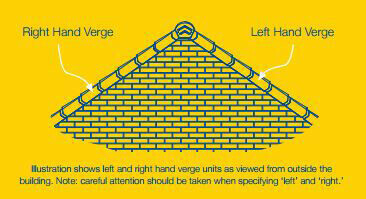 1 x Verge is required per tile - please note that these are handed: You will need to order the correct number of verges, in the correct hands for your roof. 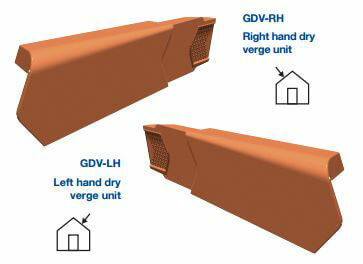 You will also need Smart Verge Eaves Closers and Smart Verge Ridge End Caps - both available separately. Hundreds of storms batter the UK every year, and with each there is a growing realisation that mortar is a costly and unreliable means of securing ridges, hips and verges. With the Manthorpe fast fit dry verge systems you have an alternative that saves you time, increases your efficiency & delivers significant benefits. The traditional methods of securing the ridge, verge, hip, and valley details of a roof with so called ‘wet’ trades are now being replaced in modern roof construction in favour of the security and flexibility offered by dry fix systems. Experience has shown that when traditional mortar is used to secure details such as the ridge and verge it will usually fail during the life of the building leading to costly remedial work to areas of a property which are notoriously difficult to access. These ‘wet’ trades are also time consuming, labour intensive and are hindered by adverse weather conditions such as rain and cold temperatures. Dry fix systems can offer the installer considerable advantages over traditional methods, providing high performance, easy to fix, maintenance free solutions which can not only speed up the job on site, but also offer long term financial benefits. More and more roofers & builders are turning to Manthorpe dry fix roofing because of the advantages it offers in terms of security, cost and installation and to escape the mess and complication of mortar based roofing techniques. Due to the nature in which the systems are fitted, there is no need for the use of mortar, making the task of finishing the verge quick, easy and clean, as well as making it possible during frosts and other adverse weather conditions. Designed to restrict the entry of birds and large insects into the roofspace. Below is a summary of the key installation points for the SmartVerge system. Ensure that the tiling battens overhang the gable end or the bargeboard by 30mm. In refurb details, fit a length of timber batten running up the run of the verge. Securely nail the required eaves closure unit into the bargeboard or facia end. Flex the first verge unit over the closure and tile. Slide the top edge under the course above, then secure the upper end through the nail holes. 38mm long, 3.35mm diamter spiral or annular shank nails are recommended fixings.